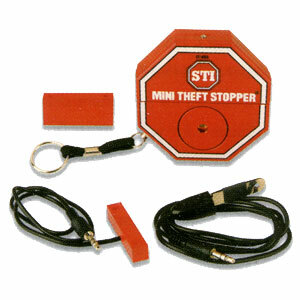 Fire extinguisher theft stopper. The perfect way to protect your fire extinguishers from theft or tampering. Highly visable 'stop sign' design discourages wrongful use of equipment. Sounds a powerful 95db warning alarm when activated. Self contained 9v dc alkaline power source is supplied. Two methods of operation - magnetic reed switch activation for cabinet and unique steel contact clip for extinguisher pins and other free standing equipment.